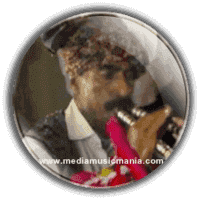 Arbab Khoso Sindhi Alghoza Instrument Artist. He is most popular Sindhi Alghoza Saaz Singer, he played Folk songs, Classical Songs, in Been on Alghoza. He was great Artist in Alghoza Been such as Ustad Khamiso Khan, "Ustad Misri Khan Jamali", and "Allah Bachayo Khoso". He sung "Sindhi, Kaafis", "Sindhi Kalams" in Alghoza, the sweet sound and voice of touching in heart and getting great poetry of "Hazrat Shah Abdul Latif Bhitai R.A" in Alghoza Been. Arbab Khoso grew up and surrounded by the sounds of the rural area and he took up the study and practice of Alghoza at his early age, now his name is top in the list of Alghoza Player of Sindh. He started singing songs in Alghoza in his young age. He sung Alghoza Sindhi Folk Songs. It is an unforgettable experience and one that can never forget, he passed a long chapter in Sindh’s cutural history of Alghoza Saaz. Alghoza. I have selected below most popular Music in Alghoza by Arbab Khoso.